The other morning I had a look at our good friend Scarlett’s great blog Heavenly Healer and was reading about her seeds now coming up (including cucumbers, tomatoes, peppers and aubergines) and it’s nice to see someone else on the “twirly” tip! 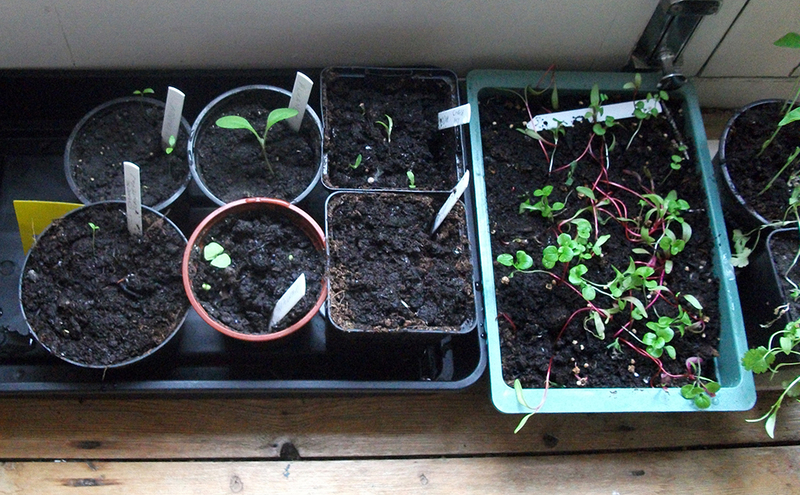 I’ve started off some seeds in the back room in a cheap plastic propagator and they’re coming on slowly. 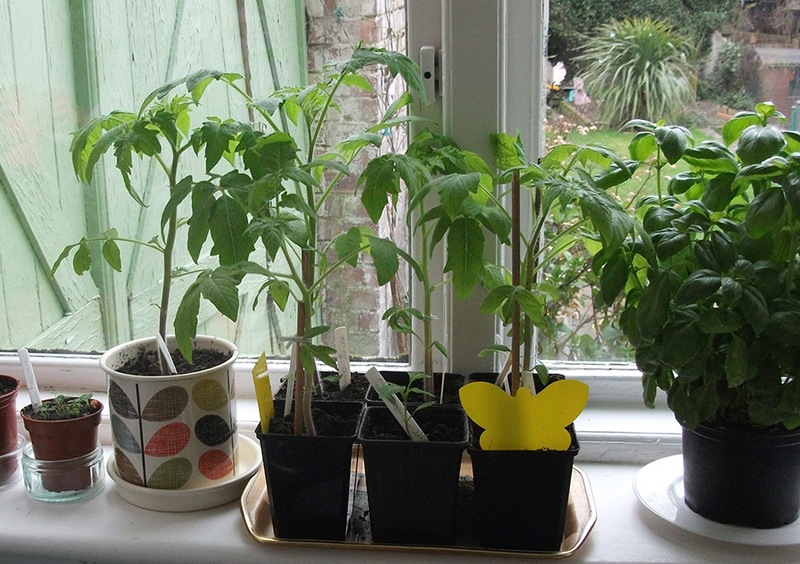 Also every year I’ve a few leggy tomato plants sitting on the kitchen windowsill waiting to go out once the risk of frost has gone and this year is no different! There’s one egg box of potatoes still chitting away merrily in the back room. Spring please come soon so we can do some gardening! Thanks very much to the good folks at Shannon’s for getting back to us about the unknown bulb in the last post and for sending us a picture. 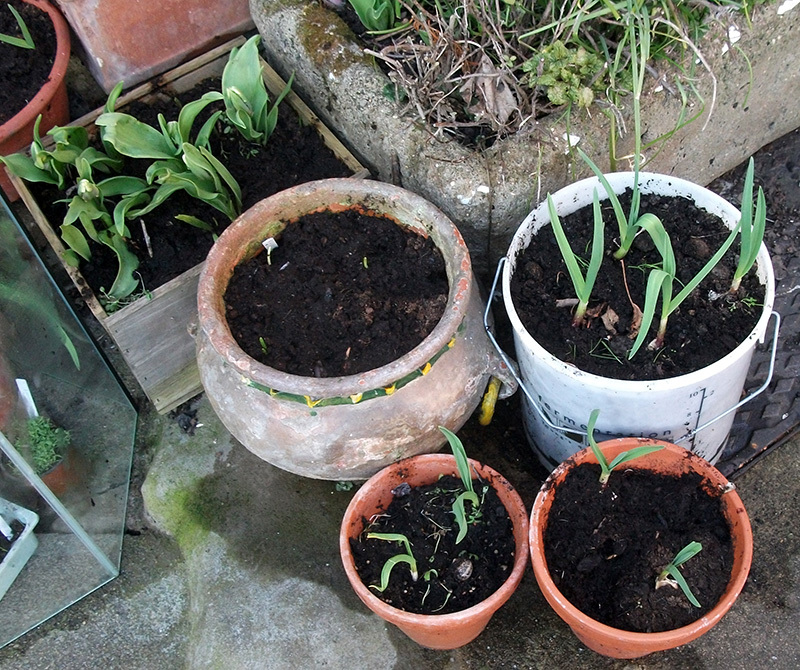 It turns out it’s Eremurus aka foxtail lilly or desert candle. Matthew Wilson mentioned in a piece in The Telegraph from 2003 (here) that “The plant grows away quickly, forming a rosette of blueish-green leaves up to 4ft high, from which the flower spike begins to rise during late April. 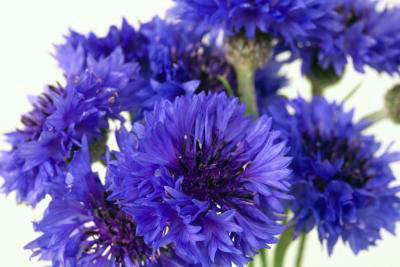 By late May the spike will have risen as high as 9ft high, more typically 7ft or so, topped with densely packed buds that gradually relax into flower.” It’s definitely one mad plant and one that’s well worth £7.99! Thanks again to all at Shannon’s and I will be sending pictures when it’s in bloom, great stuff! 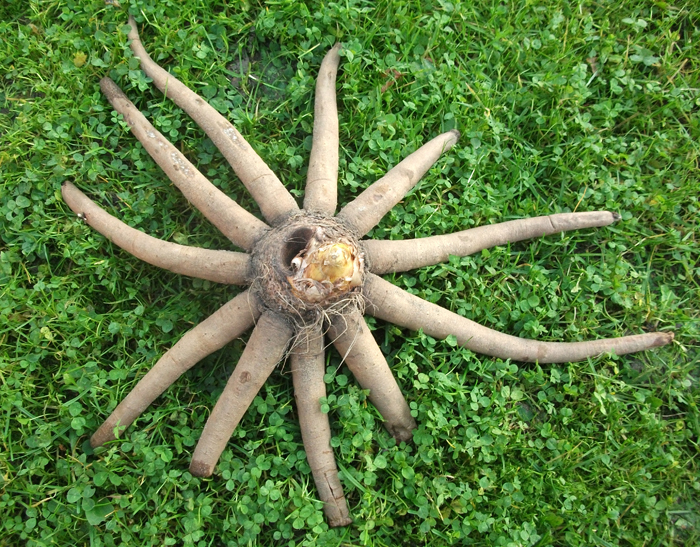 Last November I bought a mad looking corm/bulb type thing at Shannon’s for around £7. 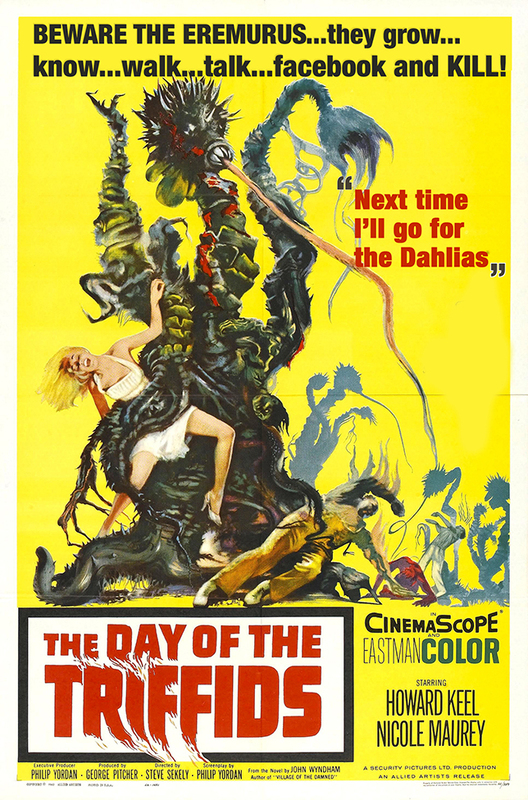 I loved the look of it at the time and also knowing it would grow into a 6ft high monster made me think, “I’ve got to have one of those!” But for the life of me, I can’t remember what it was called. Any ideas? 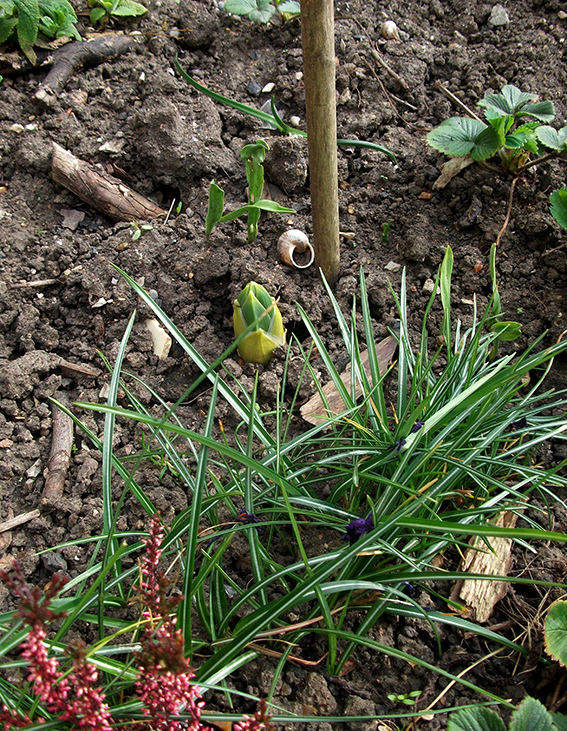 Well I’d forgotten all about the bulb until last week when I noticed this poking through the earth in one of the beds. Then in the space of a week, it’s grown into this. It reminds me of those things that came out of the spacecraft in the old version of The War Of The Worlds. Madness! 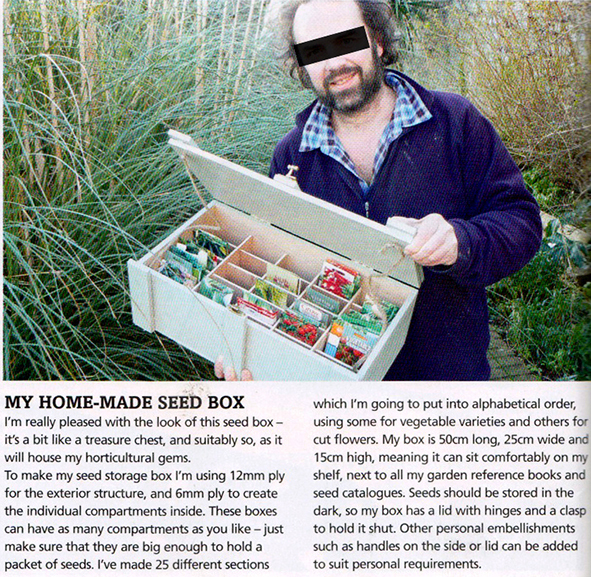 In one of this month’s popular gardening magazines there’s a feature about making your own seed box with various drawers and compartments. I know I’m a bit OCD when it comes to my seed container so I can’t talk, but making one out of sheets of plywood with “25 sections which I am going to put into alphabetical order” is taking it a bit too far I reckon. What’s wrong with an old biscuit tin? Here’s a couple of tunes (thanks to David Rodigan as ever for these!) to stick on loud while looking through your (possibly chaotic and in a non-alphabetical order) seed tin and sorting out what’s going in as the growing season is near enough with us. Happy seed tin exploring! 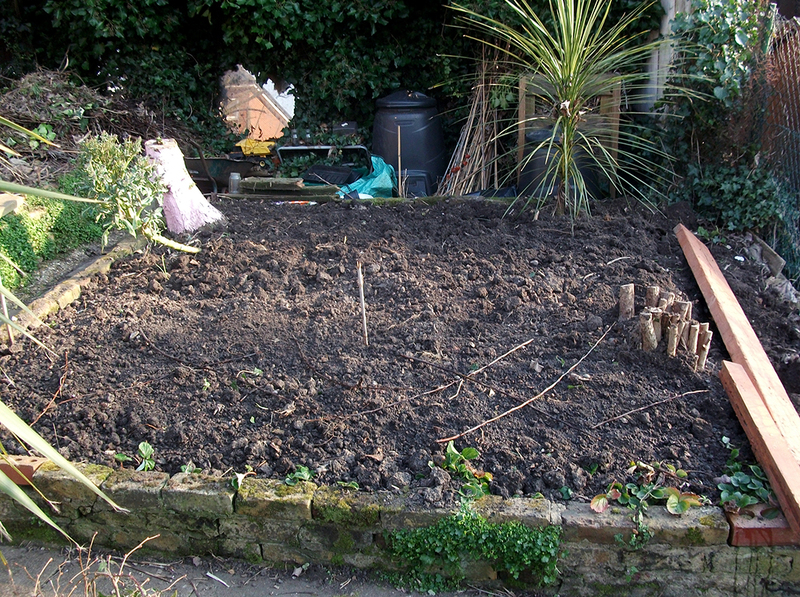 It was an afternoon of good weather today so I tipped around in the garden and finished off clearing the back bed and it was nice to see it clear of weeds for once. Talking of seeds and good value, earlier this morning I picked up a copy of “Grow your own” magazine for £4.99 for the free packets of veg seeds (little gem lettuce, basil, courgette, kale, carrot and celeriac) from the WH Smiths in Lewisham. They were also selling cut-price Terry’s Chocolate Oranges and Ferrero Rocher on a special make-shift stall outside the store because of Mother’s day tomorrow. Aaahhhhh! And to end on, a lovely tune in a hip-hop/reggae style from the great Protoje called Criminal. A tune to play whacked up loud while searching magazine emporiums for gardening mags with free vegetable seeds as it’s “that time of year”. Big up Rodigan for playing this the other week. More of the instrumental version please. And thanks to youtube, a nice live version of the tune. 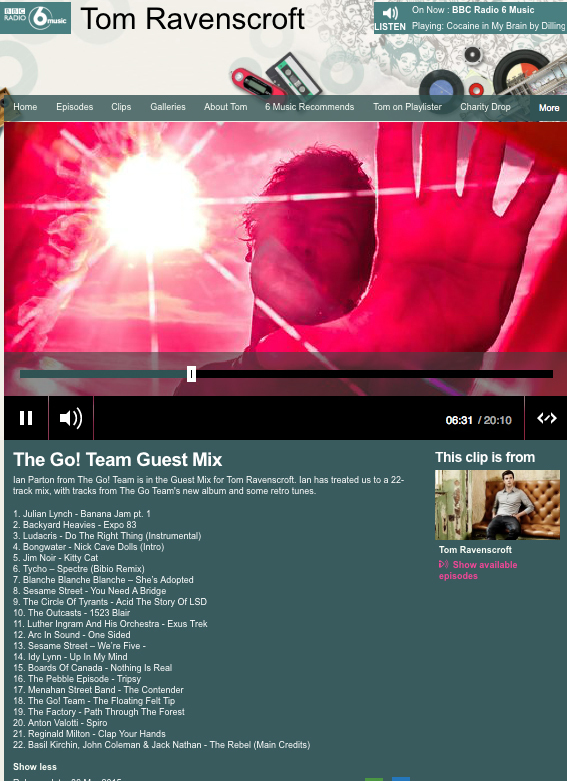 Here’s a super guest mix from The Go! Team from last week’s excellent Tom Ravenscroft show on BBC Radio 6 music. A mix of all sorts of madness! One to play very loud in the greenhouse late at night while repotting plants (with just a torch as a light source) especially when there’s a full moon. That’ll get the neighbours talking! The mix is available here. A big thanks to the weather for the weekend just gone and it looks like spring has finally sprung! 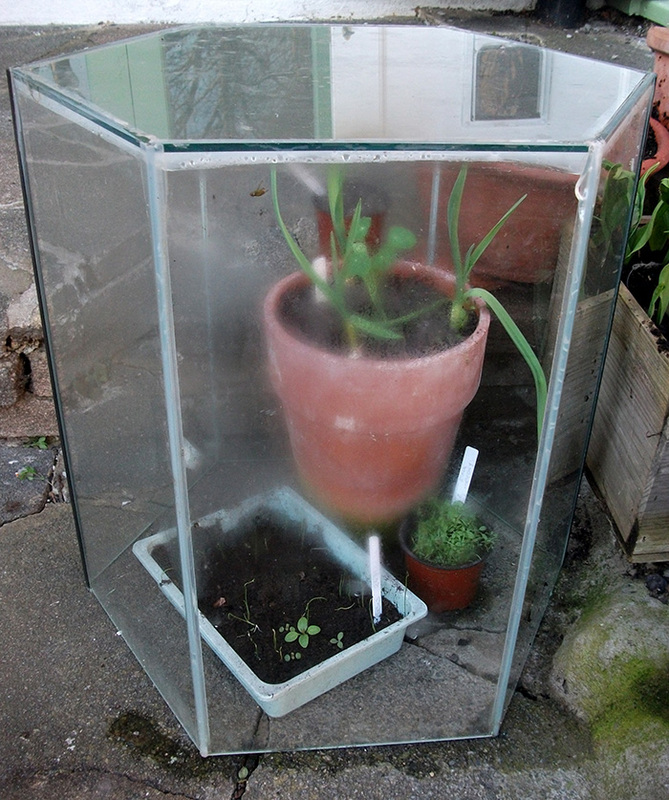 Things are certainly on their way, I’ve got some healthy looking leek seedlings, black poppies and garlic in the glass terrarium I found in the street a couple of years ago (above) and the bulbs are starting to come up in the found empty champagne case too (below). Early Sunday morning I popped into Shannon’s (ta to Paul, Araba and Alexi for the lift) and got myself three bags of multi-purpose compost to put into the new raised bed (below) made out of a couple of free scaffolding boards procured from Paul a couple of weeks earlier. So thanks to a cheap argos drill, some spare wood and a quarter of a tin of fence protector left over from last year, it’s now a home for beetroot, carrots and climbing french beans. 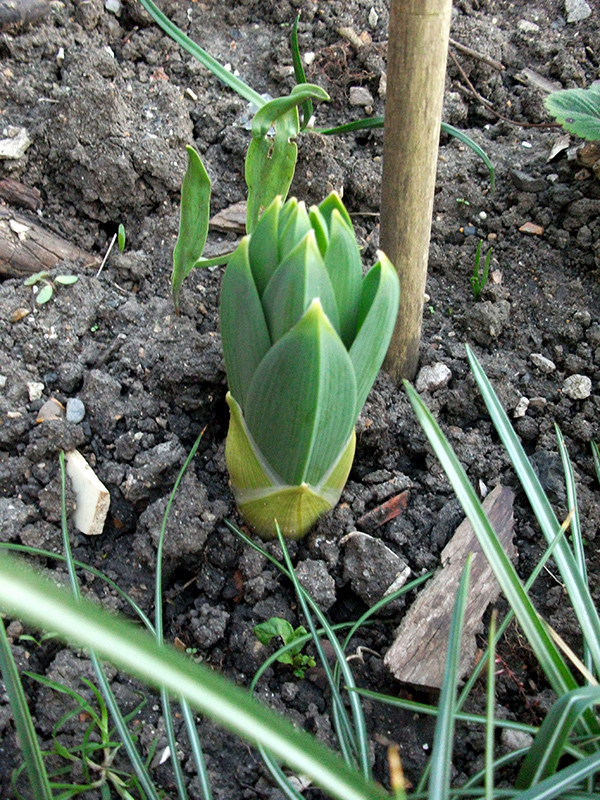 And look at the runner bean cane wigwam, that’s been put in a bit early! And here’s a tune dedicated to all who put in a few hours over the weekend with their mowers, garden forks, spades, trowels and (new pair of) loppers while enjoying the good weather in their gardens and allotments! Roll on the spring!